I find some of my best Christmas stuff in the summer at yard sales. Sure, you’re not exactly in a candy cane and eggnog kind of mood in June, but you have to buy it when you see it. 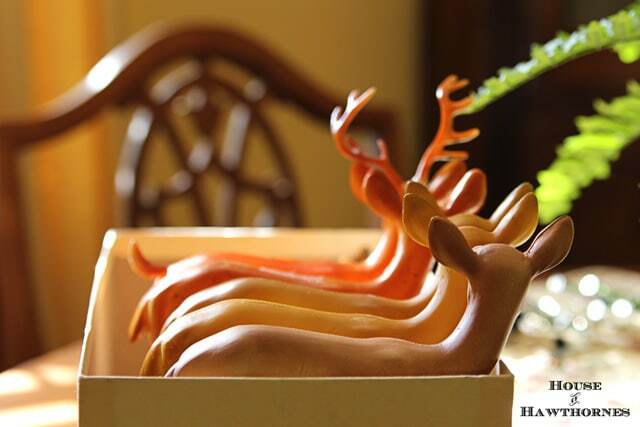 For instance, I found this box o’ deer at a yard sale a few weeks ago. Oh deer, here’s a little less artsy-fartsy shot where you can actually see my herd. I’m already thinking of what I can do with them at Christmastime. Maybe a big apothecary jar stuffed full of deer? The box came with the three wise men also as an added bonus. Like eight deer for $4 wasn’t enough! 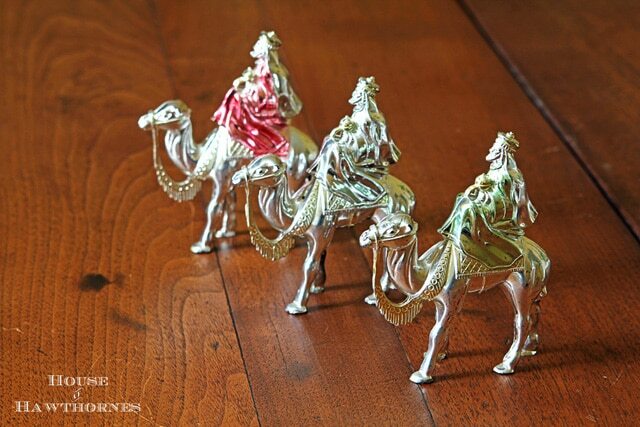 They are that plastic-made-to-look-like-silver that was so popular in the 60’s. 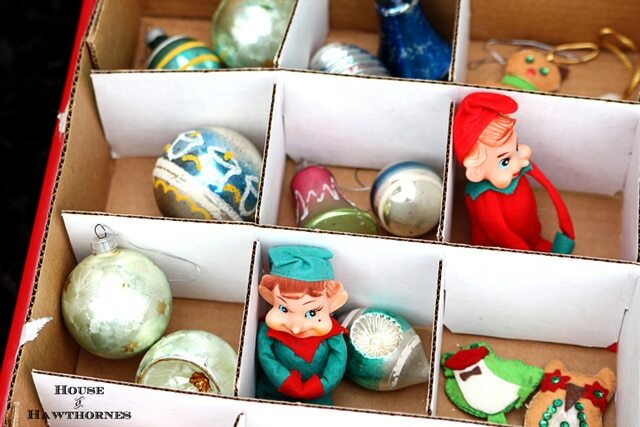 At one of the dead people’s stuff sales I spoke about a few weeks ago, I found a few boxes of Christmas ornaments. 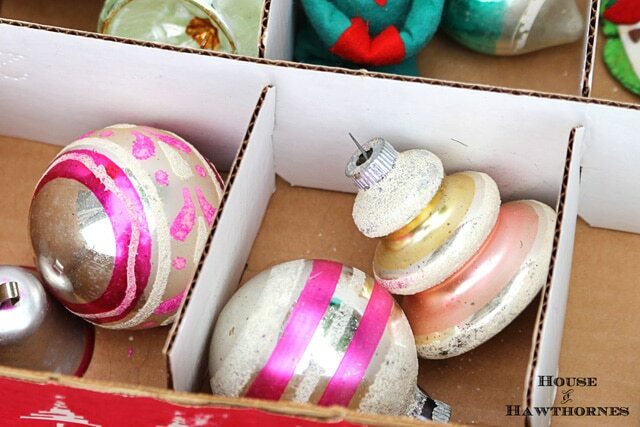 I passed on the first two boxes I opened, because they were filled to the brim with newer faux Hallmark type ornaments. If it was made prior to 1980, this girl is not interested. Just for kicks, I looked in the third box and about peed my pants when I saw some little guys hugging their knees. And some Shiny Brites with glitter on them. And just a whole lot of vintage Christmas shining back at me. Considering I paid $5 for the box, I don’t think the estate sale people actually opened it up and just assumed it was filled with the faux Hallmark like the other boxes. Do you buy Christmas stuff in the summertime? Or is December too far from your mind right now? To me, that would just be the perfect sale! I’d love to open a box and see those sweet knee huggers! 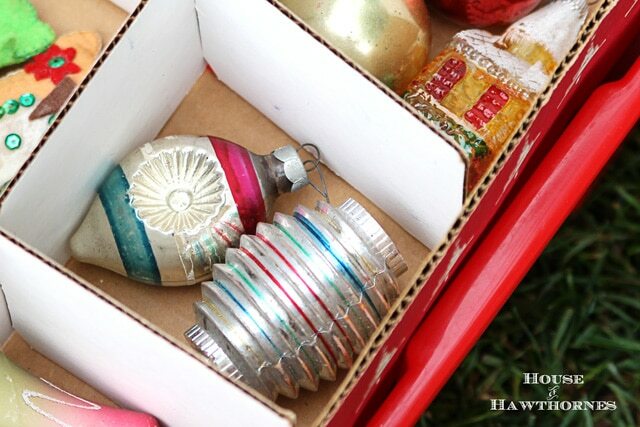 I rarely find vintage Christmas items at garage sales or even estate sales. Maybe people throw them away. 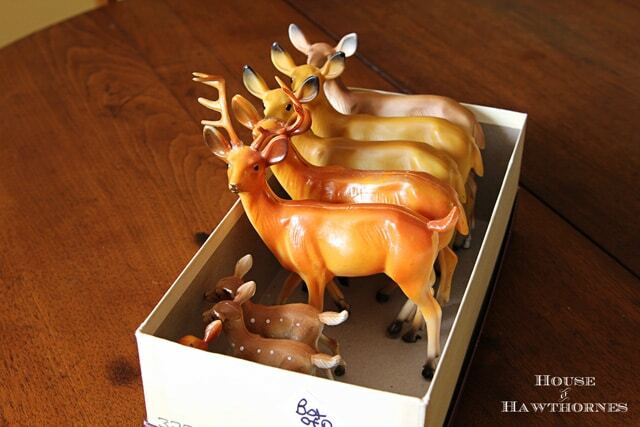 I love the box of deer. I would say that almost all of my vintage Christmas finds come from summer yard sales. I’m heading out to some today. Wish me luck!! My Christmas tree stays up year around. So I love Christmas whenever you find it. You have some real treasures there. ENJOY! Ok. I’m picking myself up off the floor. You SERIOUSLY scored at that sale. Jealous, in a good way for you. Merry Christmas! Pam I buy vintage Christmas whenever I see it! Great finds and good price! This same thing happend to me the other day! Isn’t it sooo much fun? Your ornaments are great! Sometimes, depends on what it is. Today I went to a neighborhood sale and I think everyone was getting rid of their Christmas stuff plus other holiday stuff. I asked the last lady if everyone was giving up on the holidays and she laughed and told me she just had too much and it time to get rid of stuff. Your peed your pants comment just cracked me up! Way tooo funny. Girrrlll… I buy Christmas decorations any time I find them. And I’m an ornie hoarder as in I can say… “I’ve got those exact same wise men! !” And “I’ve got some of those same ornaments!” And still I would not have passed them up if I’d seen them. Ya done good! Whoo! Hoo! You hit the jackpot! Merry Christmas! I’d buy it any time of the year if I hit the jackpot like you just did! Woo hoo!…er Ho!Ho!Ho! I just lucked out and got two copy paper boxes full of mostly shiny brides for are you sitting down for this $5! Yep that’s total! I already promised to share some with a friend – thanks to a couple of similar scores I made late last fall while garage sailing. I probably should have walked away without them – but I just couldn’t do it. I never pass up any vintage Christmas no matter the season. 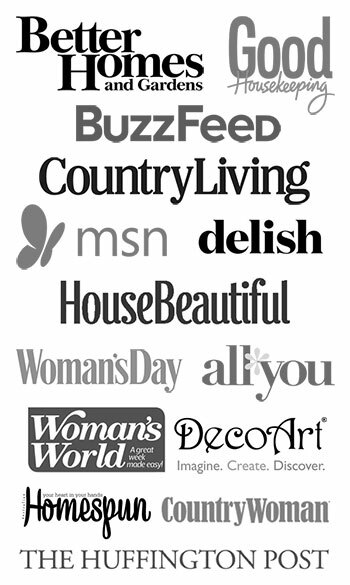 Besos and congratulations for your great finds! Those little deer would be precious in a big jar surrounded by fake snow!! Great haul! Pam, you come across the neatest things! I would love those deer and the ornaments! If I see it and it calls to me (trying not to let it call too loudly because I have too much already) loudly enough, it’s mine! I love getting Xmas stuff in the middle of summer and it’s even better if it’s on sale or in someone’s garage sale heap. Christmas stuff year round for me! Lucky to find knee huggers. I wish I had a collection of about 50. I think I have like 8 now. Yeah for you! Vintage Christmas is always fun. The deer and camels are fantastic! I love vintage Christmas, the deer are adorable and who wouldn’t just about pee their pants over a box of beautiful old ornaments! 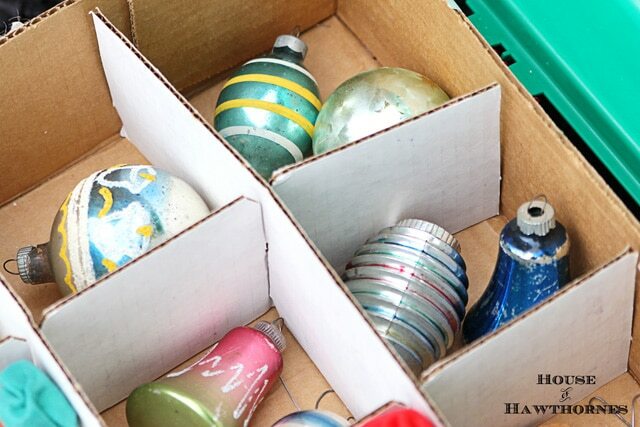 What is better then vintage Christmas ornaments I see quite a few of the same ones I have in my collection if I had found those finds I be coming home with them to. When it is not the season is the only time I do find Christmas items. I found two boxes of Shiney Brites at an estate sale this spring. The elves are sweet. 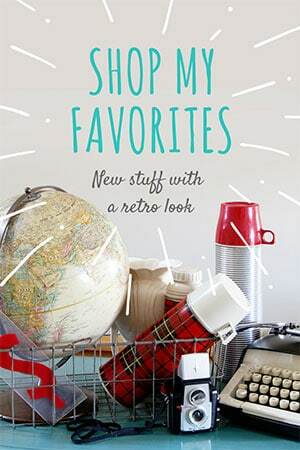 Great finds and crazy good prices too. I would buy them now if I found sweet items like those. Any day of the year, that gorgeous stuff would be heading home with me…pure eye candy and my favorite thing to find!